Get out your needle and thread and get to work. 1. Lay the garment flat onto a surface. 2. Insert the needle one stitch below the end of the unstitched seam. 3. Pull the thread taut and repeat the stitch again to secure it. 4. 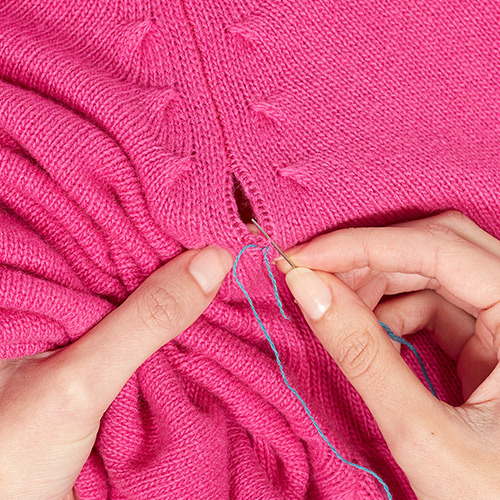 Using the needle and thread, stitch together one loop on the left edge of the unstitched seam with one loop on the right edge. 5. Pull the ends together and move on to the next stitch. 6. Repeat the operation until the seam is completely mended. 7. 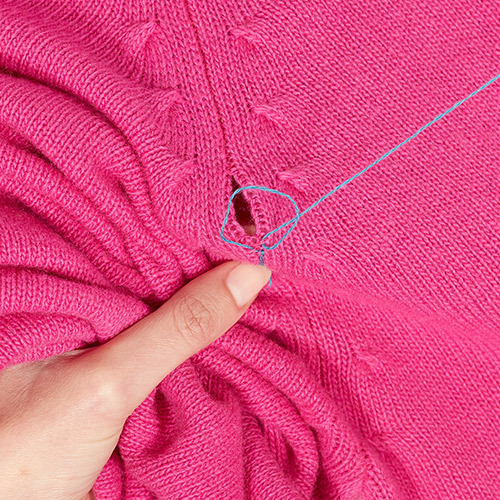 Bring the needle under the last stitch and pull the thread towards the inside of the garment. Finish with a few extra stitches to secure and use the scissors to trim off any excess thread. 8. Your garment is ready!